When I first learned to bake, I’d make all the cookie recipes in my mom’s old cookbooks. The vintage Better Homes & Gardens New Cookbook and The Fannie Farmer Cookbook were well-worn and loved, so my first cookies came from those books. When we finally got Internet, I branched out and Martha Stewart’s recipes became my favorite. 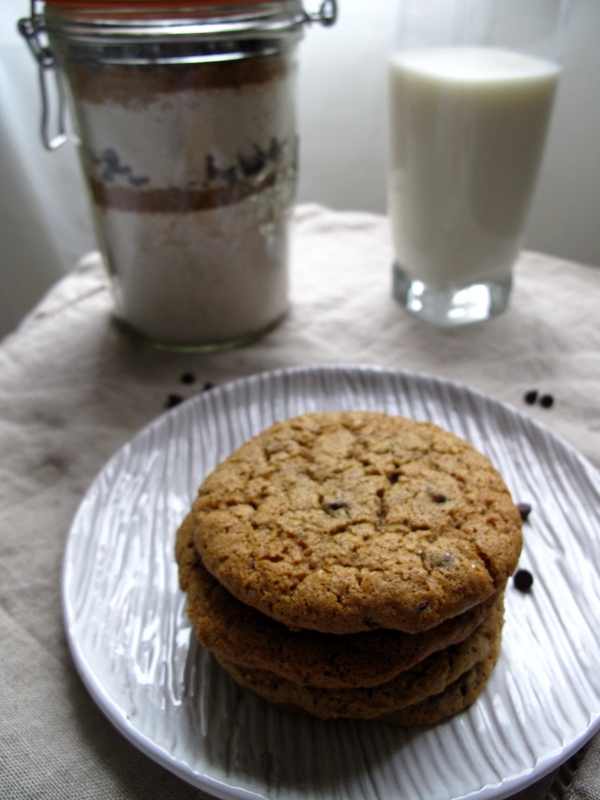 Chocolate Chip was never my go-to cookie, but it was my sister’s, so I ate my fair share. I had a particular fondness for oatmeal raisin, and while I always made chocolate chip as thank you gifts, I never could bring myself to choose them for my own enjoyment. Until W and I attempted a completely revamped chocolate chip cookie. 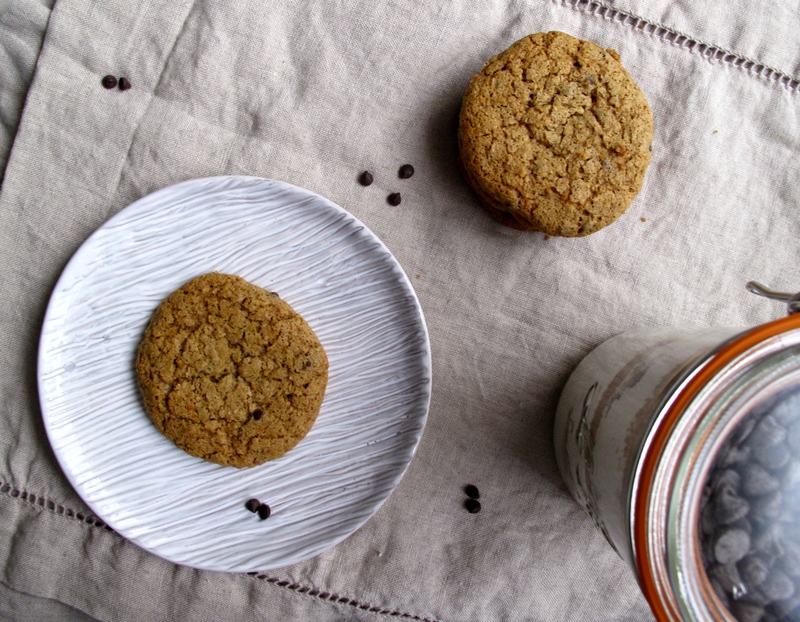 These cookies have brown rice syrup and oil instead of butter, and just enough finely ground oats to give them a hint of oatmeal-cookie-texture. They stay soft for days on end when other cookies go dry and crumbly. They have the best flavor. 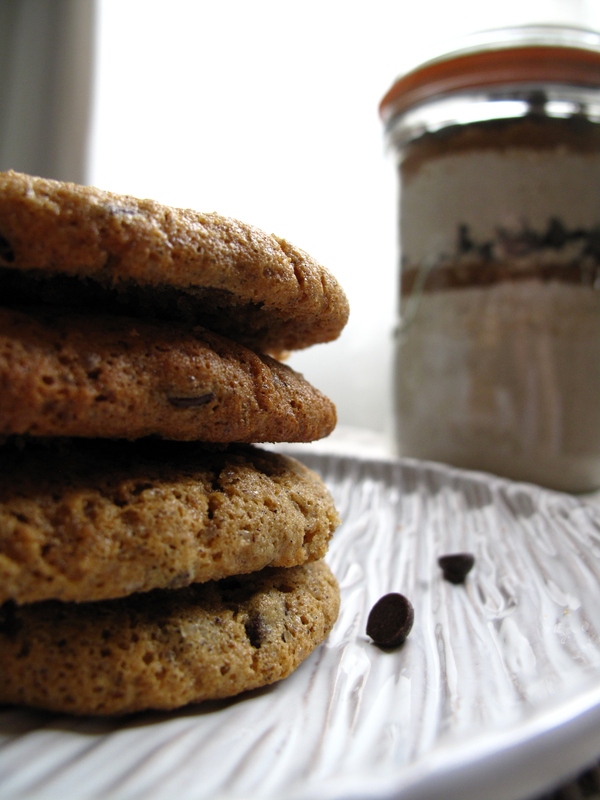 They dunk nicely in a cup of tea, if you’re a non milk-and-cookie person. And they are gluten-free! These are the cookies W requests, the ones we like to have on hand when friends come for dinner, the ones W liberally talks up to all the relatives, and eats by the stack during long study sessions. 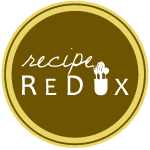 The Recipe Redux‘s November theme is holiday mixes, and these are definitely the cookies we will package up into a nice make-at-your-leisure jar snuggled into our holiday gift baskets. 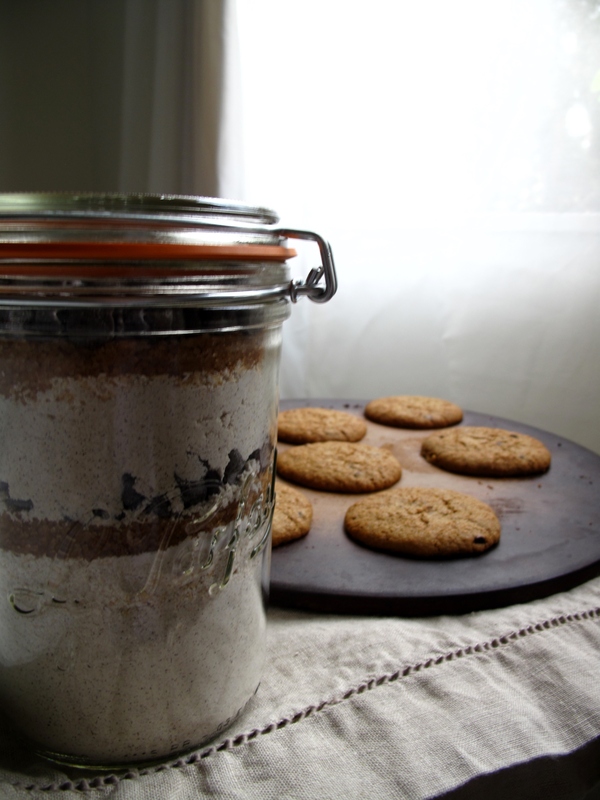 For a packaged cookie mix, measure out and layer dry goods into a large jar. Lay chocolate chips along the top, and seal. To make cookies, mix dry ingredients in large bowl. In medium bowl, whisk together oil, egg, syrup, vanilla and water. Stir into the dry ingredients, and mix in choolate chips. Cover and chill the bowl of batter for about an hour or overnight. 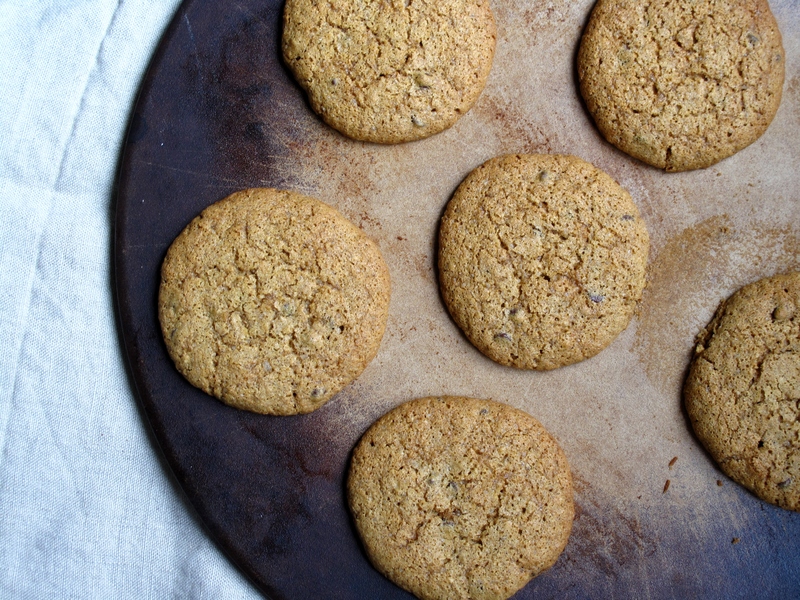 Bake each batch for about 10 minutes at 375 degrees F.
Oatmeal chocolat-chip has always been my favorite cookie flavor. Do you think the mix would work with egg replacer instead? I LOVE oatmeal, so I always seem to find a way to put in things :) While I have never tried using egg replacer in these cookies, I can’t see a reason that it wouldn’t work! If you give it a try, let me know!